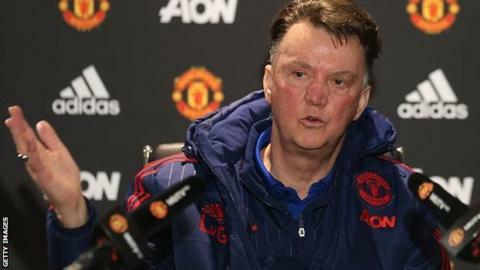 Manchester United boss Louis van Gaal says he is unfazed by Pep Guardiola's desire to manage in the Premier League. Bayern Munich coach Guardiola, 44, has announced he will leave the German club in May after three seasons. The former Barcelona boss has been linked with both Manchester clubs as well as Chelsea and Arsenal. "He has that ambition and he wants to sniff the culture of England and the Premier League. It is very good he wants to do that," said Van Gaal. Where next for Pep Guardiola? "I'm at the end of my career so for me it's not so interesting. "For me, it's interesting how I take care of Manchester United in my contract." Van Gaal, 64, is contracted at Old Trafford until the end of next season but his position has come under scrutiny after an eight-game winless run in the Premier League that ended with last weekend's 2-1 victory over Swansea. Why is Guardiola in demand? Barcelona's most successful manager with 14 trophies in four years, including three La Liga titles and two Champions Leagues. Took a year's break before joining Bayern in 2013, following the club's Champions League, Bundesliga and German Cup treble under Jupp Heynckes. Won the league twice in his two full seasons with Bayern, who are eight points clear in his third campaign. He is yet to win the Champions League with the German club and has been knocked out at the semi-final stage twice. They face Italian giants Juventus in the last 16 of Europe's elite club competition in February and Guardiola said: "Winning the Champions League would make my time here complete."